What is Solvit Deluxe SUV Cargo Liner? The Solvit Deluxe SUV Cargo Liner is made from a super-soft, micro-suede top fabric that is designed to last for years to come to protect your vehicle from dirt, pet hair and dander. 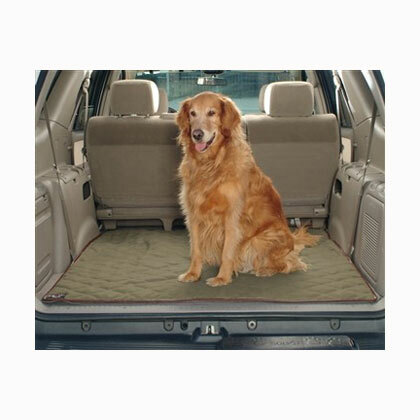 The quilted padding provides a comfy place for your pets to relax while you're traveling, and it helps keep the back of your car clean and free of scratches. There are multiple hook & loop fasteners on the underside of the liner that keep it firmly in place. It's also treated with Stain-Blok for stain and water resistance, and if it does get dirty, you can stick it in the washing machine. Once you've installed the Solvit Deluxe SUV Cargo Liner in your car, your pets can enjoy the ride in comfort and style, and you can keep the cargo area of your SUV clean. Always make sure the floor of the vehicle is dry before installing the Solvit Deluxe SUV Cargo Liner. The SUV Cargo Liner is designed to lay flat in the cargo area of the largest model SUVs when the rear bench is removed. There are nine (9) strips of hook tape sewn into the back of the liner. The hook tape strips adhere to most common types of automotive carpet, and they will help keep the cover in place. If you have a smaller SUV, you can attach the liner to the automotive carpet on the back side of the seats in front of the cargo area with the hook tape, so the large liner will still work in your vehicle. In addition to the hook tape, the cover includes four (4) strips of loop tape with adhesive backing. You can use these to help secure the cover to the plastic panels on the sides of the cargo area in narrower vehicles. Follow the instructions below to adjust the liner for narrower cargo areas. Place the liner in the desired position in the cargo area. Using a pencil, make a small mark on the plastic panels to correspond with the locations of the four hook tape strips closest to the back of the vehicle. Clean the plastic thoroughly with alcohol around these four marks. Peel the protective strip from the back of the loop tape strips, and adhere to the cleaned areas. Reposition the liner so the hook strips align with the loop strips to secure the cover to the side panels. Promptly wipe up any foreign matter or standing liquid with a damp cloth or sponge. Machine wash the cover in a commercial size, front loading washing machine. Use cold water with a mild detergent. Line dry.